We all know that breed characteristics were selected for the breed’s intended work, and breed mixes carry the inherited traits of each of the breeds, to a greater or lesser degree. But nowadays it’s rare that we ask our house dogs to do the work for which they were intended, even as those traits still surface, often to our dismay. The trick is to tap into those natural traits of your dog, channeling them in positive, creative games and tasks, while discouraging some of the more troublesome aspects of their behaviors. Becoming involved in breed-specific sports can be a great way to tire them out while also giving them the joy of practicing the jobs they were bred to do! 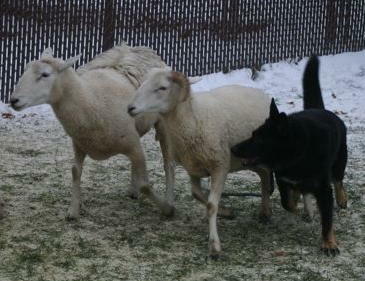 Herding dogs were bred to herd flocks of sheep, so the sport of sheep herding can be great fun for them! The American Herding Breed Association has a compiled list of training facilities as well as events and competitions in the sport and there are extensive on-line resources available. 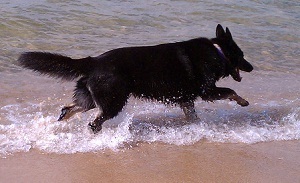 As an alternative, herding behavior can be directed to other outlets, such as the waves at the beach. Dogs bred for pulling large loads, like Newfies and Berners and the working dogs of the Northern breed group (like huskies, samoyeds, malamutes) can enjoy many canine sports that exist today. Clubs exist for the sports of carting, weight pulling, sledding and skijoring. There are also more informal sports programs: the Training Wheels® Urban Solutions Lug-Nuts™ Program was created in answer to the dangerous urban activities that predominantly involve the bully breeds and threaten their well-being. Lug-nut dogs are put in harness and compete by dragging plastic children’s sleds piled with bags of dog food. Scent hounds like bassetts and beagles were bred to follow a scent, so getting involved in the sport of tracking can satisfy their desires. A neighborhood training facility may offer classes in tracking, but it can be a difficult sport to practice without a private yard. Nose work is a variation on the theme that is easier to do in smaller spaces. Even games such as “go find it!” are great activities you can do at home with your nosy pooch! For sight hounds like greyhounds, the sport of lure coursing is a great option. For some fun on your own, you can simply buy a lure course whip from a tack shop, attach a squeaky toy to the end of it and take your pup out into a large fenced-in area for some fun! Terriers were bred to rout out the hiding places of small game such as badger, fox and otter, so offering them a sandbox for digging can satisfy this inclination while also affording a good workout. Many of these dogs also enjoy games of chase such as lure coursing. Retrievers enjoy swimming and a brisk game of retrieve. The sport of dock diving provides a combination of these activities – a toy is thrown into the water and the dog dives in to retrieve it. In competition, the length of the jump is measured. Sports such as competition obedience, rally obedience, agility and Adventure Coursing, freestyle, treibball and flyball can be great fun for both dog and handler. Look for a neighborhood training facility that teaches classes. And, finally, training your dog as a therapy dog through such organizations as the Delta Society can be deeply rewarding and gratifying. Ultimately, you know your dog and you know his strengths, so use them to best advantage, for your dog’s well-being as well as your own.